Homepage > Featured > How Then Shall We Vote? This year’s American presidential campaign has been fascinating. The compelling spectacle has captured our country’s attention and will be analyzed for decades to come. To be fully transparent, I’m writing this article months before the actual election, so it could have become even crazier than I can imagine. This week is the culmination of our journey through the United States political process. To mark the occasion, I’ve been asked to address what all of this means for us as Christians. I can’t lie: writing this article makes me nervous. Politics are divisive, and I’m a people pleaser who doesn’t enjoy alienating anyone. No matter how carefully I craft this article, someone will get offended. But I’ll embrace the challenge because it’s important for Christians to continually reassess the intersection of our spiritual lives and the world in which we live. Many of us have been taught that our political preferences should be a reflection of our faith. For the past few decades, older conservative Christians (in this context, baby boomers and Generation X) have generally aligned with the Republican Party. This can be traced back to the Moral Majority movement led by the late Jerry Falwell. The Southern Baptist preacher consolidated conservative support in the late 1970s/early 1980s that influenced the American political landscape; eventually many GOP leaders adopted issues championed by evangelical Christians. Yet in this election cycle, those same evangelical voters have become dismayed that the Republican Party has started to ignore key social issues. And since the Democrats continue to champion more of a progressive ideology, quite a few Christian voters felt they had no choice but to align with a presidential candidate of questionable moral fiber who promised to take up some aspect of their cause. Earlier this year, Falwell’s son, who serves as the president of the nation’s most influential evangelical college, endorsed Donald Trump for president. In doing so, the Christian leader made a trade-off: even though Mr. Trump has a past full of controversial actions and questionable views, Mr. Falwell believed he would best represent the interests of evangelical Christians. While this decision is fully permissible, both for a Christian and an American, it had far-reaching effects. For older conservative Christians, voting for a political leader is no longer cut and dry (even though it never really was in the first place). It signals a new reality where the Republican Party can no longer serve as the default political party of evangelical Christianity. In case you’re uncomfortable with my previous statement, understand that the Democratic Party cannot fulfill those needs either. And just so I can offend everyone possible, neither the Libertarian, Green, Constitution, Socialist, or Reform Parties are able to resolve our spiritual tension. Since I’ve looked at the perspective of older evangelical voters, let me shift to how many Christian young people are approaching this conundrum. I spend considerable time around the next generation, and they’re watching this election very closely. It is my observation that the majority of Christian millennials I know identify more with the Democratic platform than the Republican one. This allegiance has virtually nothing to do with economic or international policies but almost solely rests on social issues. They believe that Democrats are the more empathetic political party, most notably concerning issues of race and poverty. It would be easy to dismiss the political leanings of these Christian millennials as resulting from a shift toward liberal theology, but it’s not really the case. I know many young believers who hold biblically orthodox positions on moral subjects (for example, the issues of abortion and homosexuality), yet they will not vote Republican because they view them as intolerant. In their eyes, it’s more politically prudent to display grace than to demand justice. So who’s right—older Christians or younger Christians? It’s virtually impossible to determine. While the Bible paints some political issues as black and white, some are extremely nuanced and clearly gray. And there are other issues for which there are no biblical principles to determine which side is right or wrong. As a brief example, consider taxes. While Jesus clearly told believers to pay our fair share to the government (Matthew 22:15-22 ), we cannot definitively outline a biblical position for supporting or opposing a local school levy. In moments like this, when there is no clear-cut scriptural guideline, we are called to vote our consciences; indeed, this is what we should do every time we enter the voting booth. Our conscience is our intuitive decision-making guide, and it’s a biblical concept. In Romans 2:15, the apostle Paul stated that those outside of Christ are without excuse because they have the innate ability to discern right from wrong—the conscience that God put within us. To be clear, our consciences were affected by the fall of humanity and aren’t perfect. Yet as this election season illustrates, the political process itself is far from flawless, so applying it to our voting decision is apt. It’s perfectly permissible for believers to vote the lesser of two evils. It may seem undesirable to some, but it’s our freedom as Christians and our right as Americans. The blessing of the American political process is that we can vote for whomever we choose, whether they have the best platform or merely the most interesting name. (I’m convinced that is how some local judges get elected.) 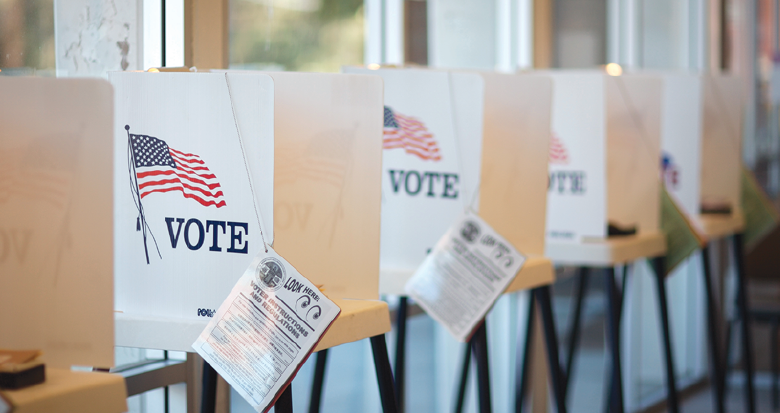 The voting booth is filled with competing ideologies that rarely align perfectly with biblical theology. If an issue or candidate arises that clearly violates a biblical precept, then submit to the Scriptures. Otherwise research, pray, listen to your conscience, and cast your ballot. The sooner we accept that we can’t be the perfect voter, the less stressful the decision becomes. Let’s be clear: politics has never been an adequate fulfillment of the highest expectations of the gospel. Many have romanticized about the America that once was and are longing for its return, but it never really existed in the first place. Even in the best of times, there were millions in our nation—Native Americans, African-Americans, immigrants, and the impoverished—who suffered greatly. Ours is a great country, but we do a disservice to our Lord and our witness when we don’t acknowledge these historical scars. We cannot right those wrongs on election day. Though we honor our country’s political process, we must remember that it’s just an earthly kingdom, not the kingdom of God. What If My Candidate Loses? DO NOT BE AFRAID. Even if you disagree with the results, keep it in perspective. We see in the book of Acts that the gospel flourished most brilliantly in a culture that conflicted with Christian beliefs. Ironically this is something the Moral Majority movement overlooked in their fervor to preserve America’s Judeo-Christian values. The early church was unable to transform the broader Roman culture, but souls were saved at a dramatic level. Even though those earliest believers were not politically successful, they altered the future of humanity with their faithfulness. 2 Kings. We forget how flawed the rulers of God’s people were. At its very best, Israel’s monarchy was an abject failure; the results were horrifying. And the same issue that plagued the kings of Israel and Judah affects the politicians of our age: they could not (and cannot) refrain from taking advantage of the power at their disposal. The adage that “power corrupts” has constantly been proven true, both in the Bible and among our government leaders today. No one on the ballot this Tuesday could ever approach that ideal. Regardless of what political leader or party gains control, our work as Christians will continue. Our citizenship is in Heaven, and Christ will always prevail. Steve Carr (houseofcarr.com) is a Vice President of Ministry Development with CDF Capital and preaching elder at Echo Church in Cincinnati, Ohio.